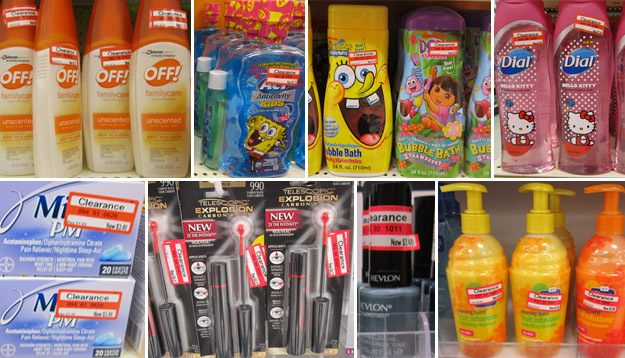 Here’s what has been spotted on clearance this week along with any coupon matchups I could find. Remember- clearance can vary greatly from store to store– there is no guarantee you will find the same or for the same discount. But I try & list specific varieties, prices & other details when I can, since not everything gets stickered and sometimes it’s worth a quick scan to check. TOYS: I’m still getting quite a few emails & comments on Polly Pocket clearance. Everyone who is finding it is still reporting it at 30% off so far. Tammy & Jennifer also sent me pictures of sets they found clearanced too that I have not seen go at my store yet- so keep checking in on it. You never know and we still have that super nice coupon for $5.00 off ANY Two (2) Polly Pocket Items. Toys ranged from as low as $4.18 for a Pool Party Polly Doll to $13.98 for a Hangout House Playset- so some nice deals after coupon. Brianna sent me several new pics from her store including lots more LEGOS for 30% off including the Harry Potter Knight Bus marked down to $29.88, Fisher Price Hot Wheels Super Stunt Builder for 30% off marked down to $25.18, Monopoly Crazy Cash for 50% off marked down to $9.98 and lots of Thomas & Friends stuff up to 30% off. BABY/KIDS: Lots of reports of clearance going on in the kids’ department again this week. 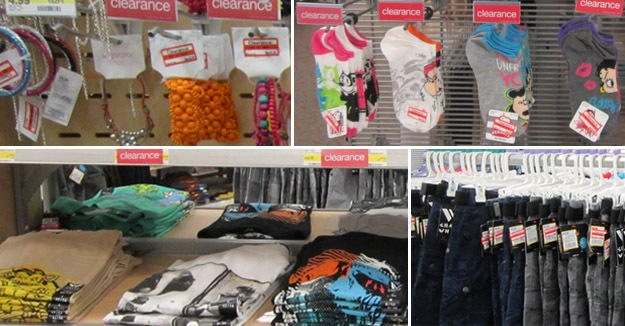 Kids socks were spotted for 30% off as well as Shaun White shorts and tees as low as $6.48. Teena found a nice assortment of Kids jewelry including bracelets, necklaces, watches and more up to 30% off. In the Baby department, Nina found lots of Evenflo full-sized car seats on clearance at her store for 15% off, something to keep an eye on for a bigger drop. Also lots of car accessories/organizers by Eddie Bauer up to 50% off and a Graco Digital Baby Monitor also 50% off marked down to $44.98. In addition to the clearance on baby clothes that was reported last week, lots of baby accessories have been spotted up to 30% off including sneakers, sandals, socks, sunglasses, hair bows and head bands and more. WOMEN’S: In the women’s department, lots of sleepwear and C9 active wear was spotted up to 50% off including bras, tanks and shorts. Also spotted on clearance as much as 50% off, were Gilligan & O’Malley Bras as low as $7.48 and Barely There Strappy Camis marked down to $8.48. 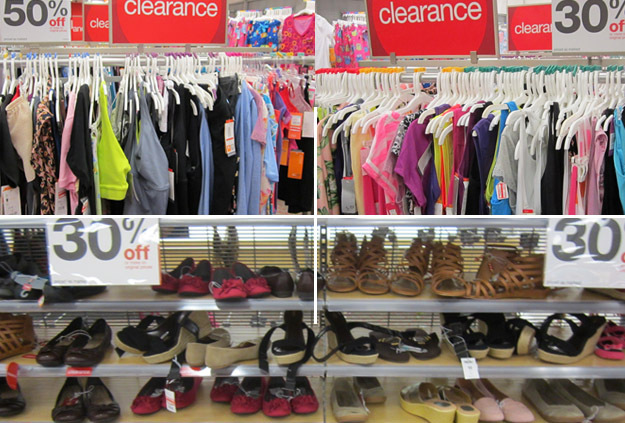 Lots of women’s shoes and sandals were also reported on clearance for 30% off. HOME: Many of you are still reporting clearance finds in the garden department but it does seem to be tapering off. 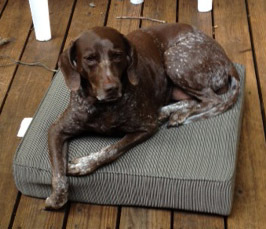 Kelley found one of those deep seat cushions for 70% off marked down to $8.98 and it made the perfect resting spot for her dog Cappy on her outside deck. Doesn’t she look content? 🙂 Much cheaper than buying an expensive dog bed! Jackie & Heather both found Kingsford Orderless Charcoal Lighter for 50% off marked down to $1.68. If you got the regional $1/1 and $3/2 Kingsford Match Light 6.7 lb+, Original 8.3 lb+, or Lighter Fluid 32 oz TQ 6-24 SS x10/1 it makes for some super cheap lighter fluid! Good luck and happy hunting! –Feel free to let us know what your latest finds are in the comments below and big thanks to Brianna, Sally, Tammy, Jennifer, Nina, Jackie, Heather, Liz & Kelley for help with this week’s roundup! I saw a talking Thomas motorized engine on clearance. I’m hoping it’s a match to the $3 coupon. The dollar bins in the front of my store have 50% off all blue spots, which is a bunch of gift bags, Sesame Street items (books, cups, bowls), Hello Kitty everything, sidewalk chalk, tons of things! Where can I find the 3 off coupon for thomas? looks like this mama will be charging up the Target card again wooot! I went yesterday and found Seattle Best ground and whole bean coffee marked down to 4.75. Finally used the $2.00 off 1 coupons I had been holding on to. I went the other day and found my kid’s most wanted bday presents on clearance. Picked up the talking Optimus Prime helmet for $9.99 (normally $19.99) for my son and a My Little Pony plush storyteller set which includes a talking plush pony and 4 cd’s for $13.99 (normally $27.99). There was only one pony on the clearance endcap, and the rest of the stock was in the regular aisle with no markdown tag. I scanned an unmarked one just to check (in case the one with the clearance tag was missing something) and it also scanned at the clearance price. Great deal and just what my kids wanted for their upcoming birthdays. And I lucked out that it was the one in a million day that they were actually not shopping with me, which was a nice bonus! Most clearance at my store in toy section was 30%- some on endcaps and some still inline. My store has an annoying habit of putting toy clearance on the endcap of sporting goods too so you have to check both sections. My littlest is obsessed with Monster High and I found Draculara’s Sweet 1600 black convertible marked down 50% from $24.99 to $11.99! I went to another Target-there are 3 near me- and they had the same car priced at $16.99! Luckily I bought it at the first store and since she just had her bday it’s for Christmas. I found Market Pantry microwave popcorn 94% fat variety for $.67 for a box of 6! I bought all 3 they had left. We love this popcorn. I also found Market Pantry French Vanilla ground coffee for $3.77! I found my son a Cars AquaDoodle for almost 50% off. I believe the original price was $26.99. I picked it up for $13.99. GREAT deal since we were getting it for him anyway! Stumbled on to a great Centrum deal a few minutes ago. Centrum Pro Nutrients “Fruits and Veggies” was on clearance at my S Florida store for $4.54 each. Picked up 2 and figured I’d use the $5 off coupons from today’s Red Plum. The purchase generated a $5 gift card. So with the overage and gift card it was a $5.92 money maker.